INDUSTRY.co.id - Jakarta - Bank Indonesia estimates that the 2017 economic growth released by Central Bureau of Statistics on 5 February 2018 will be 5.1 percent (year-on-year / yoy), or higher than 2016 of 5.02 percent (yoy). Bank Indonesia Governor Agus Martowardojo said here Friday (2/2/2018) that growth of 5.1 percent (yoy) in 2017 indicates the economic recovery continues after the slowing phase. "That this three-year growth trend is a recovery," he said. Agus said that economic growth in 2017 is accompanied by increasing fundamentals of economic fundamentals. This can be seen from the maintained inflation at 3.61 percent (yoy), a surplus in the balance of payments that continues to be 11 billion US dollars and stable stability of the rupiah exchange rate. "We also see the current account deficit 2017 at 17 billion US dollars, so the current account deficit 2017 is fewer than two percent of Gross Domestic Product (GDP) of 1.8 percent of GDP," said Agus. If the Central Bank's projection is correct, then economic growth will climb again in 2017 after growing 5.02 percent in 2014, then down to 4.79 percent in 2015 and rise to 5.02 percent in 2016. Before 2013, Indonesia's economic growth is at the level six percent. Separately, Chief Economist of PT. 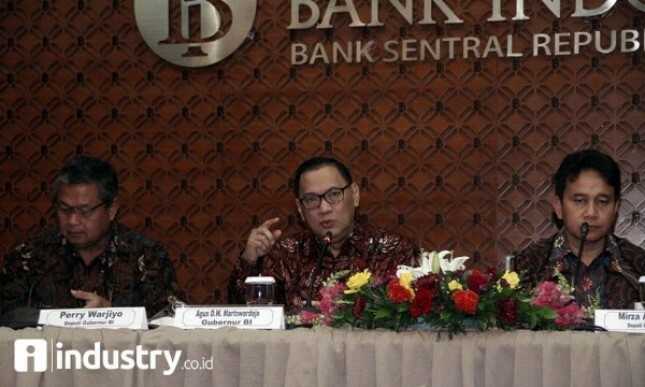 Bank Mandiri Persero Tbk Anton Gunawan said the realization of economic growth in the range of five percent is still far from enough to reach the government target of eight percent in 2019 and quantitative target per capita GDP to Rp71, 97 million. Indonesia, said Anton, still needs to optimize productive sectors such as manufacturing industries whose contribution shrinks to Gross Domestic Product (GDP) per quarter III 2017.